326 pages | 37 B/W Illus. It is argued here that measures of poverty and inequality are most useful to policy-makers and researchers when they are finely disaggregated into small geographic units. Poverty and Social Exclusion: New Methods of Analysis is the first attempt to compile the most recent research results on local estimates of multidimensional deprivation. The methods offered here take both traditional and multidimensional approaches, with a focus on using the methodology for the construction of time-related measures of deprivation at the individual and aggregated levels. 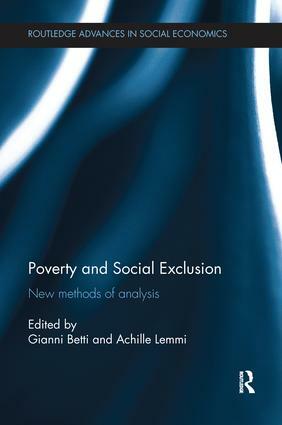 In analysis of persistence over time, the book also explores whether the level of deprivation is defined in terms of relative inequality in society, or in relation to some supposedly absolute standard. Achille Lemmi is Full Professor in Statistics and Economics and Director of the Research Centre for Income Distribution at the University of Siena, Italy. He is Associate Editor of Statistics in Transition and member of the Editorial Board of Journal of Economic Inequality. His life-long research interest has been the study of income distribution, inequality and poverty.